Next week will be Seattle week on DeliciousBaby, and frankly I can't think of a better time to tell you about why I love this city so much. I thought I'd kick it off with a shot of the Space Needle. 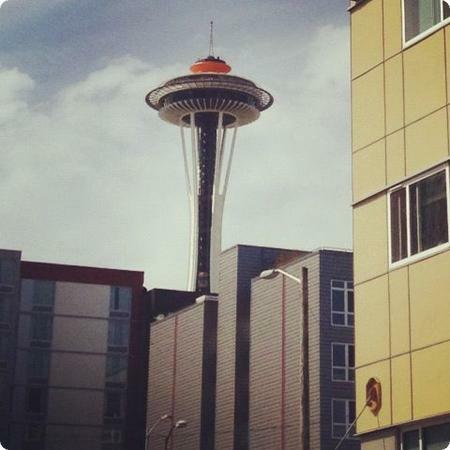 Right not the needle is painted orange (the original color used during the 1962 world's fair) in celebration of its 50th anniversary. I think it fits right in with the more modern buildings in this shot. Lisa @ Gone With The Family on June 1, 2012 at 4:30 a.m. I didn't know that the Space Needle was celebrating it's 50th Birthday already! Looking forward to Seattle week. Steve on June 1, 2012 at 9:02 a.m. The Space Needle is one of my favorite things about Seattle, but I don't think I've ever been to the top. I just love the way it looks, and how you can see it from so many places in the city. Adam Sommer on June 4, 2012 at 8:51 a.m. I love visiting Seattle as well! I must say though, I was surprised by the Space Needle the 1st time....every photo of the Seattle skyline makes it appear to be right downtown...I hadn't realized it was a bit away from city center. Regardless, its still a great attraction to visit! loco2 on June 6, 2012 at 8:55 a.m.